Depending on where you plan to operate your business, your customers are going to have different taste preferences. People in Hawaii, versus Australia, versus mainland United States all have different tastes and experiences. During the interview below you’ll hear a story how sales person that was trying to convince Rosanne from Snowy Joey to invest in Cherry Cola flavored syrups. While Cherry Cola might sell well in mainland United States, it’s not something that the average Australian enjoys or would think to order. Although some snow cone businesses will sell over 100 syrup flavors in a single location, you do not need to invest in this many syrups early on. Snowy Joey has been in business for 10 years and on average uses 18 different syrup flavors that they use to vend. The majority of your sales will come from just a handful of the flavors you have on hand. After starting your business, you will be able to identify what those top sellers are quickly. One good strategy for identifying what syrup to start out with is to visit other snow cone businesses in your area and see what is selling well. Usually there will be four to five different syrups that generate the bulk of the sales. You can also ask your syrup supplier outright: What are your most popular flavors? Most suppliers will be happy to share that information and you will get a quick sense of what people like and what sells by completing these two simple activities. To get you on the right track some of the most popular snow cone syrup flavors are listed below. Again, these will change depending on where you’re living in the world. Some Syrup Flavors are Interchangeable. One important note that Rosanne points out is that there are flavors that people really like and those that people really hate. In addition to having the most popular flavors on hand, you’ll want to have a variety of colors that your customers can look at when approaching your stand. This enhances the overall attractiveness of your setup and provides the illusion of a lot of options. Don’t forget that before customers ever taste your snow cones, they see your product first. Pro Tip: Click Here to Learn How Snowy Joey Started a $1 Million Dollar Shaved Ice Business. The other thing to keep in mind is that some flavors are almost interchangeable so you don’t need everything under the sun. Someone might approach your stand looking for strawberry flavored ice, but will just as happily purchase a watermelon or cherry flavor if you don’t happen to have it on hand or are sold out. Keep these interchangeable recommendations in mind as it will help you increase your overall sales during peak season. Don’t let customers walk away without offering a close alternative flavor. In addition to all the different flavor and color combinations of syrups that Rosanne recommends, she also suggests having sugar free and all-natural flavor options. Some kids or adults can’t have sugar. In addition to losing out on sales, it can be really disappointing for a kid that can’t have sugar to see all their little friends enjoying snow cones. Having a sugar-free option ensures that those kids don’t miss out on the experience of enjoying this cool summer treat. 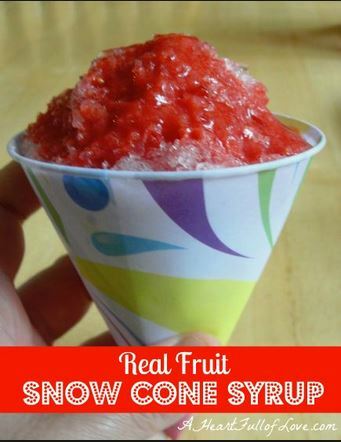 If you’re looking to add premium sugar-free syrups to your shaved ice stand, check out Ralph’s SnoBall Supply Inc at SnowBallSupply.com. Here you can order syrups that have no calories, no carbs, and is made using Splenda instead of sugar. One of the mega trends that has only grown since the 2000s is that we as a population are looking for healthier and natural food options. And this trend isn’t just limited to meals, but deserts and snacks like snow cones as well. Having a selection of natural syrups can encourage health conscious parents to purchase a snow cone for kids or themselves, but even further than that these syrups can help you book more lucrative gigs. By being able to state that you have natural syrups and flavoring can help you get the foot in the door at schools and sporting events. It can also help differentiate your sales message from all the other snow cone vendors in your area. If you are looking for natural shaved ice flavors, check out Snowie.com. They have some extremely popular flavors in natural options too, including Tigers Blood, Apple, and Root Beer. The Bottom Line: At the end of the day you don’t need the most syrups to build a great and profitable snow cone business. Make sure you’ve got plenty of the most popular flavors in stock like Cherry and Tigers Blood (if you live in the United States), have a variety of syrup colors on display to make your stand or trailer more eye-catching, and have some sugar-free / natural syrup options. 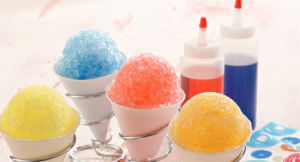 If you want to learn more about the snow cone business, check out this interview with Snowy Joey that went from one shaved ice machine to generating over $1 million in sales over a ten year time period.